MOORESVILLE, NC (January 18, 2019) – Gifted Travel Network in North Carolina has become a member of the by-invitation-only Virtuoso® luxury travel network, comprised of top leisure travel agencies in North and Latin America, the Caribbean, Europe, Asia-Pacific, Africa and the Middle East. According to Vanessa McGovern, Co-Founder & CEO of Gifted Travel Network, the agency’s membership in Virtuoso will bring a host of rare travel experiences and exclusive offerings to its 200+ advisors. “Becoming part of Virtuoso is a huge milestone for our host agency. 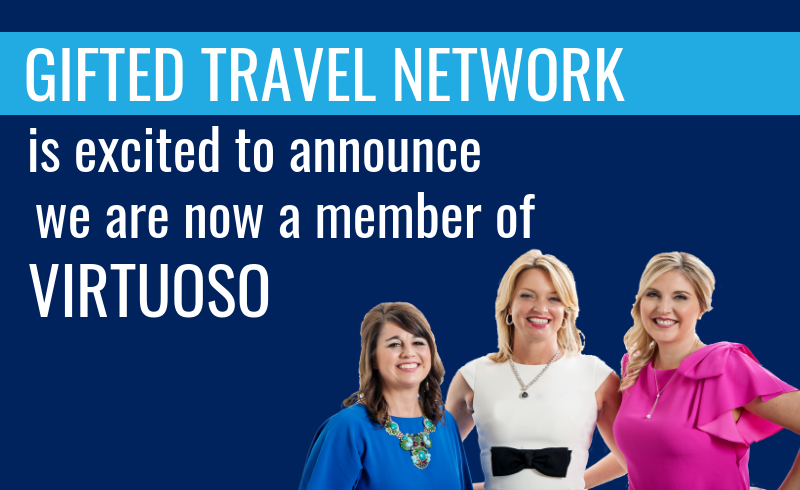 We’ve created a best-in-class training program at Gifted Travel Network and to have the power of all that Virtuoso offers backing our advisors just solidifies that we host and offer the best in the industry,” said McGovern. Beyond the monetary value, Gifted Travel Network’s membership in Virtuoso gives its advisors direct access to the world’s finest hotels, resorts, spas, cruise lines and tour operators, as well as expanded insider knowledge and insights into the industry’s hottest trends and destinations. These personal network connections will now allow Gifted Travel Network to secure VIP treatment around the globe for the clients of its advisors. For more information about Gifted Travel Network and its new Virtuoso affiliation, email info@giftedtravelnetwork.com or visit www.giftedtravelnetwork.com. Gifted Travel Network is a host agency founded on the belief that there is unlimited potential in the travel industry for travel professionals who understand the new market dynamic and employ cutting-edge marketing principles. GTN’s unique program offerings and unparalleled support help travel professionals identify their brilliance, define their niche, and implement successful business strategies so that they can make more money selling travel. To learn more about Gifted Travel Network, please visit: www.giftedtravelnetwork.com.